This section of the wiki is concerned with the 68k family of TI graphing calculators (this name is due to the Motorola 68000 processor they use, as opposed to the Zilog Z80 chip on older calculators). The calculators in this family are the TI-89, TI-89 Titanium, TI-92, TI-92 Plus, and Voyage 200. Unlike other TI graphing calculators, the 68k family calculators have symbolic manipulation capabilities — this allows the calculators to manipulate algebraic expressions directly, and to give exact answers rather than decimal approximations. 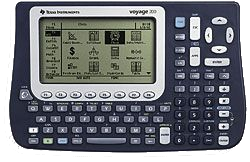 Released in 2002, the Voyage 200 is the most advanced of the 68k calculators. Like the TI-92 Plus, the Voyage 200 has a QWERTY keyboard and 240x128 high-contrast LCD screen. Together with the TI-89 Titanium, it also has the most memory: 190 KB RAM, and 2.7 MB ROM. The Voyage 200, like the other models, has also been discontinued in favor of the TI-89 Titanium.